BMD Supply a full range of Drywall Metal systems for use in building partition walls , Flooring and ceiling systems. Drywall Metal can be a quick and effective solution when building partition wall systems. With the track being laid along the floor and a parallel section along the ceiling you can then insert the vertical studs into the track. 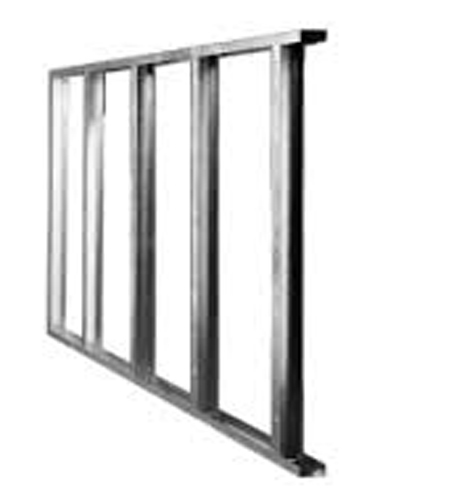 The metal stud is usually installed with a spacing of either 400mm or 600mm. This spacing provides a solid stable frame to attach the desired plasterboard. All components are screwed together with the appropriate drywall screws which come in various lengths. All of the components when installed correctly can provide a versatile solid partition wall. Partition walls can make it easy to channel services such as electrical cable and heating pipes. Metal studs are lighter than timber and so more can be moved around on site easier. Drywall metal does not take on moisture like timber so is better for places such as bathrooms etc. MF Ceiling systems are a concealed monolithic metal frame system for the ceiling giving totally concealed track. Done Properly will give the impression of a traditional finished ceiling. Acoustic metal systems are also available. These include Gypfloor silent which can be used to upgrade existing timber floor joists for sound reduction. It can also be used in new build properties for increased sound insulation performance on the internal floors. Drywall Metal comes in many different sizes so that most drywall partition projects can be covered using it. For any information or prices on Drywall metal systems please do not hesitate to call our sales office.